I chose the Versa over similar compact hatchbacks because of its cargo room capacity, spaciousness, and comfortable seats. These pros still remain, but quality and durability issues were shortly discovered in ownership. The Versa is not a very durable or quality manufactured car. The factory installed tires lost tread at 11k. The exhaust is greatly rusted (30k) and falling apart. Around 10k started to see chipping of exterior paint and 20k rusting at slight dings. Easily dents. 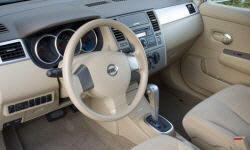 Why the 2008 Nissan Versa? Very spacious interior. I wanted a hatchback and something where the rear seats folded down, since I do a lot of moving and hauling. I liked the roominess and open-feel. Other similar cars felt more confined. I can really pack a whole lot into that little car! And I got a roof rack installed to be able to load even more on top. The seats are very comfortable. Made of squishy dense foam: not too hard but still supportive enough. I have reclined and slept in the front passenger seat overnight several times. I liked the outside look of the Nissan Versa compared to other similar compact hatchbacks. I had an old large dog who loved car rides, and this car was lower to the ground to allow her easier access, and the backseat was very comfortable and spacious for her. Human guests also appreciated the more spacious rear seat room and comfort, though for the past year or 2 I have completely removed the rear seats in favor of even more cargo room (and the excuse not to transport people). While the Versa does not have the greatest fuel economy, it was significantly better than any of the Subarus I wanted, and the fuel economy is comparable to other compact hatchbacks. 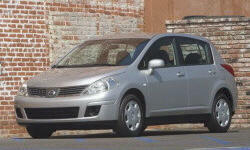 Why Not the 2008 Nissan Versa? Blind spots are a MAJOR problem. Always must use great caution when on the highway. I figure it is only a matter of time before this issue causes me to get into an accident, but since the Versa supposedly has such great safety features I should be perfectly fine and then I can feel free to get a new car. Factory installed tires lost most tread by 11,000 miles. Told by dealer there was no Nissan warranty on tires and that factory installed tires are always poor quality and its assumed the owner will install their own preference. I could have tried to pursue warranty with tire manufacturer, but the cost to do so, with removal and shipping etc. would be more than new tires. I have since bought 2 new sets of tires, one set of all-season tires and one set of winter tires (not studded). I did not like how if I had only one window open, the wind somehow would create a boom boom boom pressure sound irritating to the inner ear. Was told by dealer this is common in cars, and that all windows must be open or closed to avoid this. Also, with installing the roof rack, I believe that causes some air noise. The car easily scratches, dents, and chips, even with no apparent physical source and so just the elements. Slight exterior rusting early 18k, then discovered significant exhaust rusting at 30k. Was dismayed to find regular Styrofoam under rear carpeting when cleaning and investigating spare tire. Seems very cheap materials and construction. I was conned into getting the extended warranty, but it is not worth it at all. And so many things excluded even though I was lead to believe they would be when purchased. I seriously considered the Scion xD because I liked the dashboard colors, fuel economy, general styling, and factory standard features. The inside was not as spacious and the seats not quite as comfortable as the Versa. The Scion xD was also slightly more expensive than the Nissan Versa. I also considered the Honda fit, but the inside felt too small and the seats not as comfortable. I hate the yellow/orange dash lights of the Versa. Like you, I like the looks of the hatchback Versa (I think we are in the minority opinion on this). I was always curious about them, as I can appreciate the impressive amount of space and practicality they provide for one of the lowest sticker prices on the market. Plus, they're just about the closest thing you can find to a French car in the US market; I had hoped some character was retained in translation. It's disappointing to hear that this car was a dud for you! What are you thinking about replacing the car with?